Today's card was a good chance to play with a stamp I purchased from Papertrey Ink awhile back. I'm playing along with the Make It Monday #294 - Monochrome with a Pop of Color. I had no idea how this would turn out, but I had fun with it. The photos aren't the best, but I'm crunched for time, so here we go. To create this A2 card, I used the "Caution" stamp and tried to emulate the police tape. I stamped, embossed and cut the strip from black cardstock and used some yellow embossing powder, which worked out pretty well for it. I cut two sized of circles from the black card base and another one a bit smaller to act as a sandwich to tuck the strip of 'tape' between. To get the same finish I on the circular edge I used a Versamark dauber and then embossed it in yellow. I then die cut some balloons and dipped them in Versamark and embossed them a couple of times so that I could use them as embellishments. 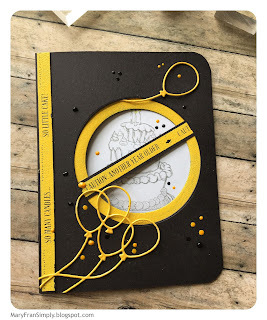 To keep the theme going I stamped a birthday card so that it was visible from the unopened card and only colored the flame on the candles with yellow. Once the card was assembled I used some enamel drops in yellow and black to give it a little pizzazz...sorta (-:. Thank you for reading and the supplies are listed below.